"Prestige" buffalo grass in January 2013, approximately 5-months after planting in 2012. I scattered some mulch around the plugs closest to the camera to try to keep down weeds. The majority of the plugs, especially those furthest from the camera, just have bare ground between them. So last August, as some of y'all may remember, I took the plunge and planted some buffalo grass. 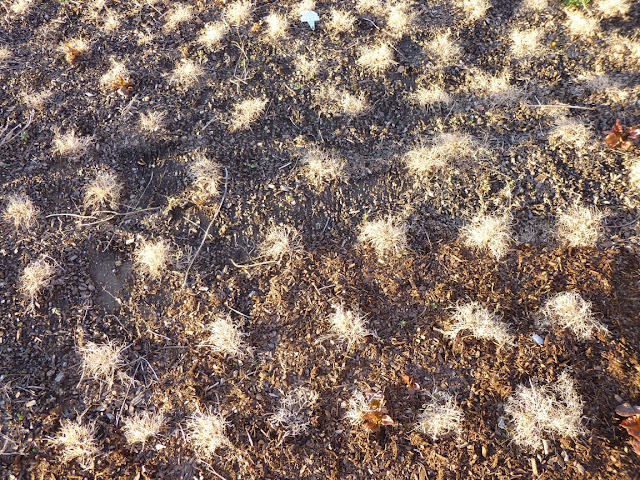 1) Buffalo grass is supposed to be very tough and able to tolerate heat and drought. This is important because summers can be very hot (90-100+ Fahrenheit) in Tennessee for months at a time -- sometimes without any rain for weeks. I'd like to cut down on my supplemental irrigation, so finding plants that can survive a drought is key. 2) Buffalo grass is supposed to be low-growing. Especially the varieties that are sold for lawn use - like the Prestige variety I bought - are only supposed to get 4-6 inches tall over an entire season. That means you could theoretically not mow your lawn at all, or maybe just once or twice per year. 3) Buffalo grass is native to North America (although I think it is more native to Western parts of the continent). 4) Buffalo grass requires far less nitrogen fertilizer (1-2 lbs per 1000 square feet) versus conventional lawns (e.g. Bluegrass at 3-5 lbs per 1000 square feet). I'm always looking for ways to reduce external inputs such as fertilizer for more eco-friendly (and wallet-friendly) landscaping. So, how did the buffalo grass planting turn out? I posted a 2nd day update, but this is my first time revisiting the buffalo grass patch since then on this blog. To be honest, it's not particularly a pretty sight at the moment. 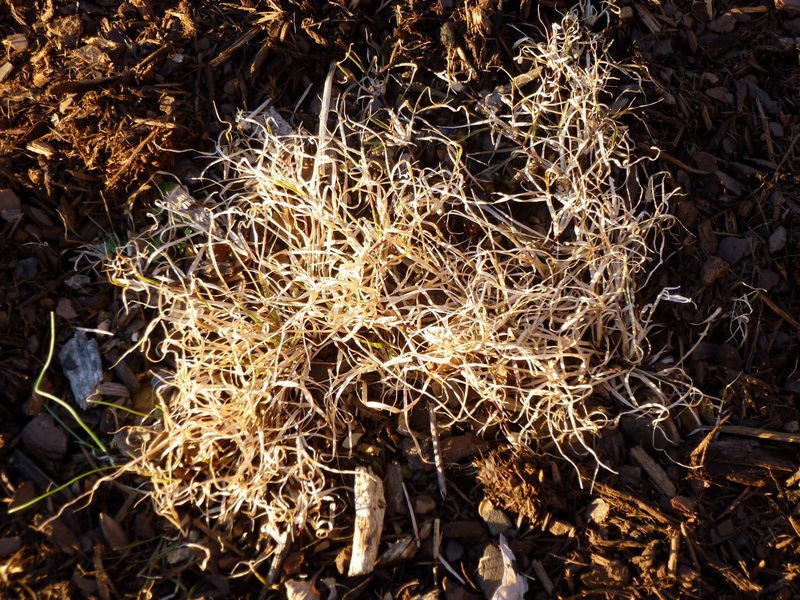 As I'd expected, the buffalo grass went into hibernation mode ('dormancy' is the technical term, I believe) once nighttime temperatures started dipping below freezing in late October and early November. 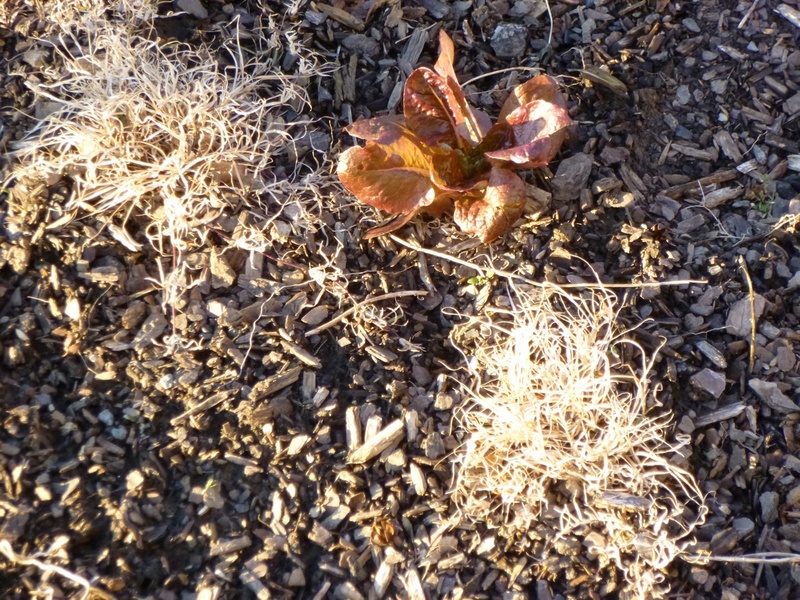 One advantage of the buffalo grass plugs not growing together yet is that there was space for some self-sown lettuce seedlings to emerge. I believe this is Merveille de Quatre Saisons. The lettuce never got all that big, but I did pick and eat the baby lettuce one night when temperatures were forecast to drop into the teens, which I thought might damage the tender lettuce leaves. The winter color is not unattractive - I like to think of it as 'tan' or 'golden'. I less charitable soul would probably call it 'brown'. Beauty continues to be in the eye of the beholder. The main lesson I think I can pass on from my experiences thus far would be this: If you live in a climate where temperatures drop below freezing in winter, it doesn't really make sense to plant buffalo grass in late summer. Because while I think all the plugs survived being transplanted into an August heatwave, I also think it took them a while to settle in and get rooted. Plus they required frequent watering around the transplant time. It probably would have been smarter to plant the plugs around May. In a good year, we're still getting nice spring rains in May, so the buffalo grass plugs probably wouldn't need much supplemental irrigation. And then they would have all summer to knit together by growing into each other along stolons. A dormant buffalo grass plug that started to send out a stolon to the left. I like the way that the dormant buffalo grass goes all curly or frizzled. 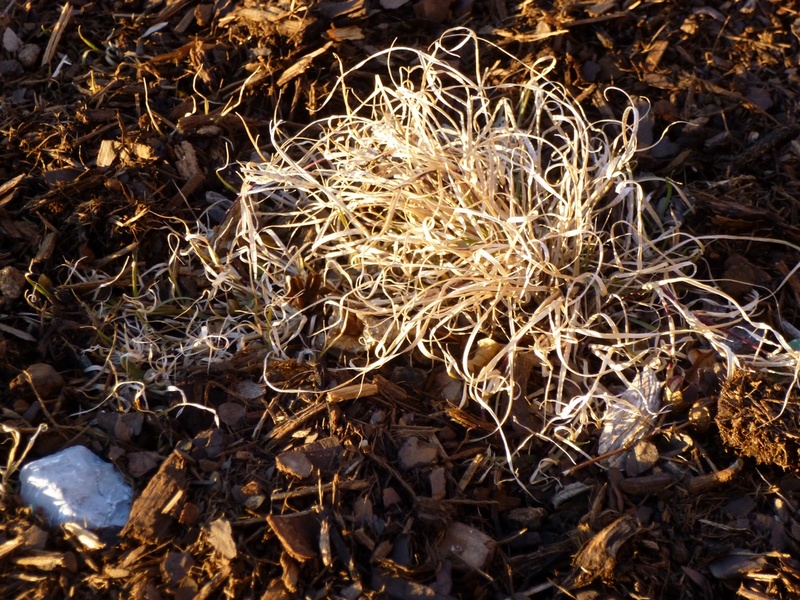 It's hard to tell from the picture, but some of the plugs did start to send out runners and interlace with one another, but they didn't have a chance to complete that process before the weather got cold and the new growth shut down for the winter. And because they had not yet knit together, that left plenty of space for weeds to develop. (I picked most of those weeds out by hand, which wasn't too hard in most cases, although I had to be careful not to damage buffalo grass roots. On the bright side, the stories about buffalo grass being a low-growing grass definitely seem to be true. When the grass did start growing, it focused its energies on lateral growth rather than vertical growth. So I can definitely see this being a grass that needs hardly any mowing to keep it at a reasonable height for a lawn. So that's the story right now. One more dormant buffalo grass plug. This one expanded a bit more than some of the others, but it has a lot more expanding to do in the spring and summer to connect with its neighboring plugs. My hope is the buffalo grass will start greening up in late March or early April, once the temperatures start staying above freezing at night and daytime temps are reliably in the 60s or higher. (It's actually around 70 Fahrenheit today, but that's not going to last. We'll be going back to highs in the 30s-40s range and lows in the 20s by the end of the week. Presuming the grass is still alive and in good shape, I will post another update when it starts greening and then hopefully be able to post additional updates in the summer if it does start forming a solid patch of grass. Based on my experience thus far, I don't feel I know enough yet to say whether or not buffalo grass would make a good alternative to other lawngrasses in the Southeast. I can say that if I were to do it over again, I would try to get an earlier start planting the buffalo grass (by June at the latest) to give them a whole summer to try to grow together and form a solid patch of turf. Do you have any questions on my buffalo grass trial experiment so far? Praise, criticism, suggestions and cheerful encouragement are all welcome in the comments section below! It's fun to tag along as you experiment with Buffalo Grass. I can definitely see the benefits of this over regular turf grass. Please do keep us posted throughout the growing season! Enjoyed reading more about it. Will be interested to see how it comes back this spring. I have never heard of this before. I will have to check into it and see if this could be a option for me too. I am east of Nashville in Wilson county and I agree with you Aaron that we do get hot summers with weeks without rain. I currently have Bermuda grass (our development mandates it) but would like to possibly grow some in my back yard. I am going to put some clover seed down here in a few weeks to naturally put nitrogen back into the soil as the clay here is so poor. Your development mandates Bermuda grass? Wow. That's strict. I thought our HOA was tough just in demanding a weed-free lawn, but at least we're allowed to pick which sort of grass we want. I've got fescue. It's not invasive like Bermuda grass, but it's not all that tough either. We've had lots of problems with weeds which forced me to hire a lawn company to spray weed-killers. I hate to do that, but the HOA frowns on weedy lawns. Regarding the clover, I tried it for the same reasons you did -- hoping it would add nitrogen into the soil. It sorta worked, but clover can get out of control really fast too in my experience and I got tired of picking clover out of the garden beds. Plus even though I tried to get the low-growing kind (creeping Dutch White) it still got pretty tall - maybe 6-inches? It grows really fast in the spring and it's not fun to cut with a mower because it kind of clogs it up. Sorry if this sounds discouraging. If you're going for a meadow effect in the backyard, it could work. But in my case, I regretted sowing it. I've never heard of Buffalo grass before. I'm going to have to google it when I leave here. Please keep posting photos, you've got my curiosity peeked! I haven't considered buffalo grass for my yard because I don't think I have the right conditions. Very interested to see how it goes for you, though. Your conclusions so far make sense. Is your yard too shady or wet for buffalo grass? We tried buffalo grass here once - it didn't do well - too hot, I suppose. Or dry. Or both. And, we tried seed, so we may have done better with plugs. Good luck with yours. I bet once it's established, it will be wonderful. Hm. I think buffalo grass is actually supposed to thrive in hot and dry climates -- like the Great Plains. I do believe it is supposed to establish much better from plugs than from seed. I am also looking forward to seeing how the experiment with this grass turns out. What is the update on the buffalograss. Did it ever came back ? I really like the way you documented the beginning of the story and I am hoping for an update on this. The short answer is that the buffalograss DID come back and it has since formed a nice short patch of greenery. It's not a *total* success story - there have been a lot of weeds to pull along the way and there are still some holes in the turf. But on the bright side, it's only been mowed once all summer (and it didn't even really need that). Stay tuned for a buffalograss post update in early September! I am looking forward for your post update.